There was only one hour left to get water. Misha Gunjar, a recent addition to the family through arranged marriage, was sick the night before, so the family slept in. It was just after 7 a.m. and normally the women of the home are up at 5 a.m. to fill water for the day. Ruhmini Gunjar wakes up early in the morning to fill the family’s water bucket before the water shuts off at 8 a.m. But the family didn’t have to go far to a well, river or communal tap. The eldest woman of the house, Ruhmini Gunjar, simply stepped outside, green hose in hand. She screwed one end onto the tap coming out of the house and dropped the other into a plastic 50-gallon drum. Then with the flip of a valve their water for the day began to flow. Suraj, the 29-year-old son of Ruhmini and Vitthal, emerged from his room in a dark track suit with yellow accent, poofy black hair still combed back, a messy version of the almost John Travolta from Grease style he sported the day before. Rubbing the sleep from his eyes Suraj carried wood in a burlap sack to the copper boiler Ruhmini had just set in the street. 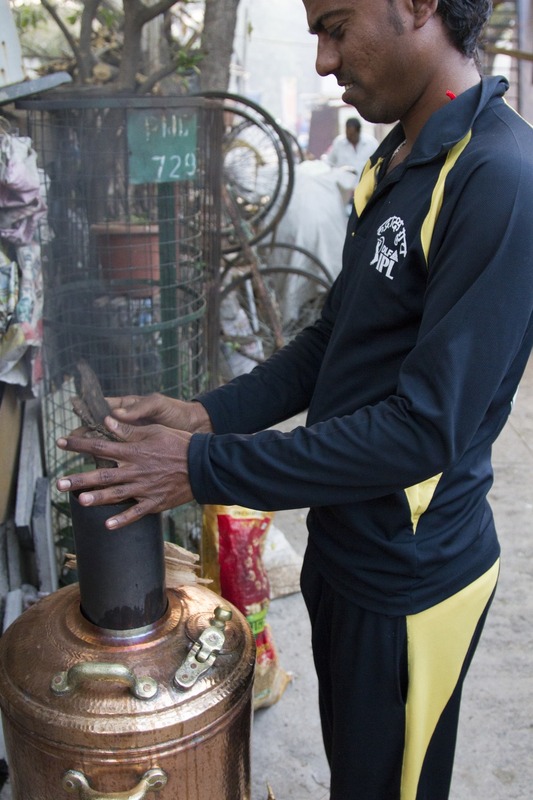 To heat enough water for the family of seven to take showers, Vitthal Gunjar fills the copper boiler several times. It took three pails of water to fill the boiler, then Suraj dropped some wood into the top. They gather the wood from a nearby hill still covered with trees, and still use this traditional style of heater because it is cheaper than the new electric ones. “If we have a forest or a farm, from there we can get the wood supply and it’s all free,” Vitthal said. With a splash of blue lighter fluid and the drop of a match, the water began to heat. The Gunjar family boils water only for bathing, the copper and iron pots they use to hold drinking water are filled straight from the tap and drunk with confidence in its cleanliness. So far no one in the family has fallen ill because of the water. The Gunjars have gotten their water from that tap for two of the last four generations that their family has lived in the same crowded neighborhood. Even for citizens in the lower class, Pune provides clean water with consistency and quality higher than other large cities in India. Many people live in similar narrow, crowded streets and brick buildings like this part of Wadarvadi. Copper and iron pots are used to store the drinking water for the day. They refill the drinking water everyday so the water doesn’t go stale. Suraj Gunjar pours lighter fluid from an Old Monk rum bottle to start the fire. Suraj adds wood that the family collected from a nearby hill to heat the water for the family's baths. The neighborhood where the Gunjars live in Wadarvadi is colorful but crowded and old. Houses are built with brick and topped by tin. Chickens run the narrow streets and women wash clothes outside their houses. The Gunjars have a family of seven living in three small rooms. The young children are privileged with the wooden twin sized bed. Grandma and Grandpa sleep on the living area floor, with the 7-month-old hanging above them in a sling. Suraj and Misha sleep in a separate room. Both Suraj and his 64-year-old dad, Vitthal, hold steady work. Vitthal works as a laborer building homes and Suraj is a construction manager. Between them, they earn about 200,000 rupees a year, Suraj said. 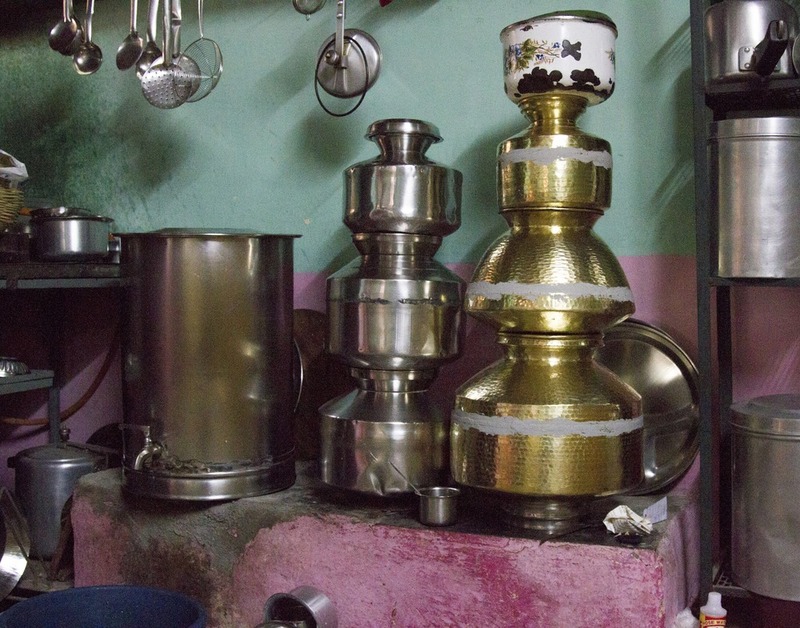 Vitthal can remember when there used to be a communal tap for every five houses, but when he was still a child, the city installed taps into every house in his neighborhood. Many of these areas, such as the neighborhood where the Gunjars live, only receive water in the morning from 4 to 8, but the water comes straight to their house and is safe to drink, a luxury far less common in New Delhi and Mumbai, Mishra said. The difference, Mishra said, is Pune’s location and history. The city of 3.1 million, according to India’s 2011 census, is surrounded by the hills of the Western Ghats, which get substantial rainfall each year. The hills descend sharply into Pune, providing the city with nearby water access and an easy way to let gravity carry it down to homes and businesses. In contrast, New Delhi has to pump its water uphill from distances of more than 100 miles away, Mishra said. The cattle owners who let their livestock graze by the Mula River flowing through central Pune don't let the animals drink from its polluted water. Transient workers living in tents next to the Mula River only use the filtered water they get from a water truck that comes a couple times each week. A constant stream of garbage flows down the Mula River piling up on the banks and forming large islands of garbage. The Mula river flows straight through Pune. Some transient workers set up tent homes on the river’s bank and locals who own livestock let their cattle graze on the grass that grows on its banks. But nobody touches the river, even the livestock don’t drink from its polluted waters. 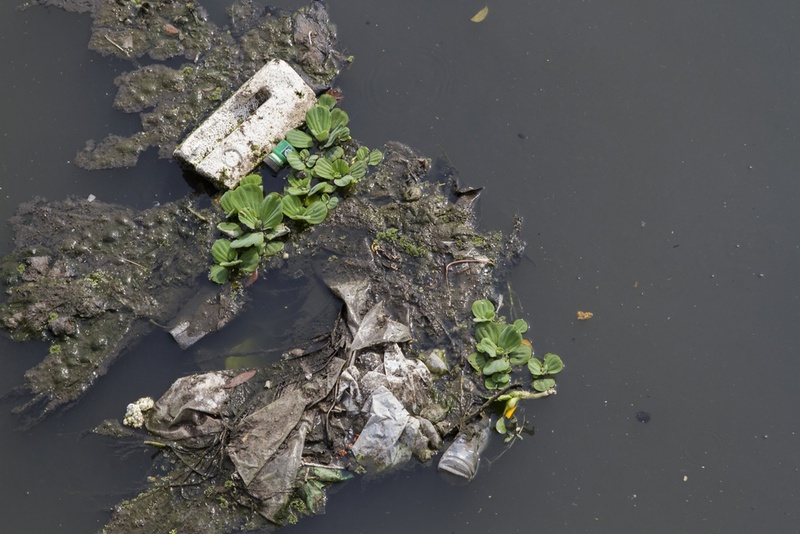 The river is a haven for trash, depositing its dirty cargo in piles on the banks. The whole area reeks of pungent rotting waste. Water trucks, like this one, are used to deliver clean water to areas of Pune that don't have a connection to the municipal pipes. In other cities, like New Delhi, tankers have developed a stake in the local government and discourage building of reservoirs that could take away their business, Aushutosh Mishra said. Water instead flows from several dams built in the hills around Pune. The water that flows from the Gunjars’ tap originates at the Khadakwasla dam and is treated by the Pune Municipal Corporation. The water around Pune is abundant enough that citizens who live in areas without a water pipeline, like the transient workers living by the river, have access to clean water trucked in by the municipal corporation and deposited in nearby water tanks, which are normally filled several times a week. This water access has played a large part in making Pune the well established city it is today, Mishra said. The Brahmin kings made it their capital city, and today it draws many businesses, immigrants and students to its promising streets. “Largely Pune is blessed with an abundant water supply and great access for all its people,” Mishra said. Occasionally the Gunjars don’t get water, but they said they are always notified first if the city is going to shut off the water for maintenance. Vitthal said he’s thankful for the water they have, and he’s even okay with the 3,000 rupee ($50) tax they pay each year. Suhani Vithar, Suraj’s niece, fills up the water buckets for the day. Each person has his or her own role in making sure everything gets done before the water shuts off. “I understand the water needs to be treated and I think it’s fair to pay for that,” Vitthal said. Having water flow only four hours a day is inconvenient, but Vitthal said he doesn’t mind as long as they don’t reduce the availability to two hours, something Mishra said the city has been threatening but he doesn’t see happening any time soon. For now the water keeps flowing to the Gunjars for four hours. Which means they don’t waste any time in the morning, especially when they sleep in until 7. All the water containers must be filled, the dishes must be washed, baths taken, teeth brushed. All this happened in just over an hour, before the water pressure fell and the flow from the faucet slowed to a trickle. The pot beneath the tap was still filling as Vitthal picked it up and dumped it into the copper heater. Valve still open, the trickle slowed, and stopped.